WHICH ONE WAS THAT? That one with the flipping On Track/Off Track objective card and a veritable brood of Spider enemies. Beneath the Sands, Desert Creatures, and Harad Territory. Click for higher resolution. WHAT HAPPENS? Our heroes and Haradrim companions are beset by the “great spiders of the desert” who capture many of their company. 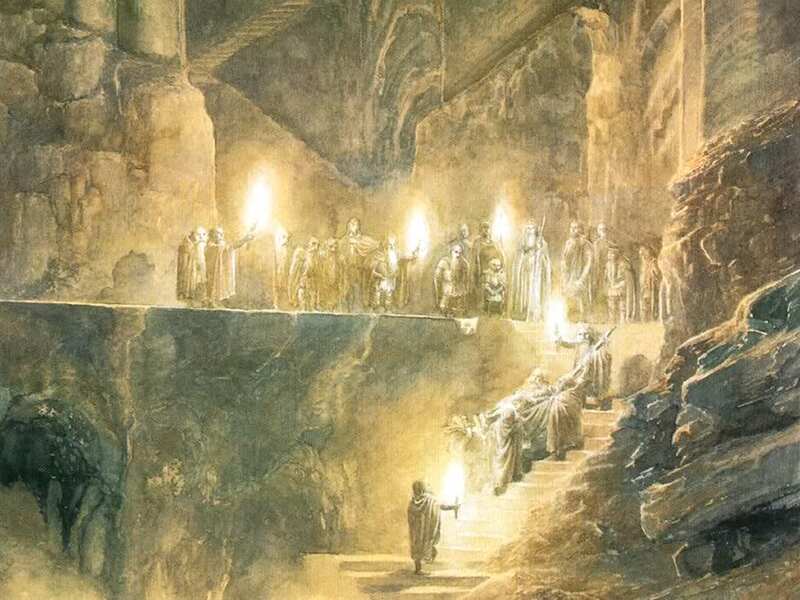 Rather than abandon them to certain death, we enter the caverns beneath the sands to rescue them. WHERE DOES IT HAPPEN? We are still making our way north back towards Gondor after our shipwreck in the City of Corsairs at the end of the Dream-chaser cycle. In the previous adventure, “Race Across Harad”, we just escaped marauding Orcs by crossing the River Harnen. The next scenario, “The Black Serpent”, has us encountering a Haradrim army heading up the Harad Road, so we are likely in the region of Harondor, a province of Gondor in its halcyon days, but now a “debatable and desert land” according to later Third Age maps. NOVEL INSPIRATION: There are competing narratives about the source of J.R.R. Tolkien’s various spider-esque creations. One story blames a tarantula which bit young Ronald and sent him running in terror across the garden as a child in South Africa. Although recalling the incident, the Professor disputed its role in inspiring his work in a 1955 letter to W.H. Auden, claiming that he had no particular dislike of spiders and would even rescue those he found in the bath. Instead, like other elements of his story such as the “long groping arm” of the Barrow-downs, Tolkien included spiders in The Hobbit to “thoroughly frighten” his son Michael, which apparently succeeded. Despite his fondness for including scary spiders in his stories, Tolkien seemed to have a different vision for these Middle-earth monsters than their real-world equivalents, often conflating some of their features with insects. For instance, the spiders of The Hobbit are said to have “many-windowed eyes” with “a thousand facets”, rather like a fly than a spider. Furthermore, Middle-earth spiders, including Shelob, can attack by stinging their prey. Indeed, this is why Bilbo names his blade Sting after his fight with the Spiders of Mirkwood. Our real-world spiders only bite. “Sam and Shelob” by John Howe (2003). Only Middle-earth spiders have a stinger on their bum. Either way, stinging or biting, with a dozen eyes or a thousand, the southern spiders beneath the sands of Harad are, of course, not mentioned in Tolkien’s writing. Rather they are original creations of FFG inspired by the swarm of paralyzing poisonous spiders from The Hobbit Chapter VII “Flies and Spiders” combined with the underground tunnels of Shelob in The Lord of the Rings Book IV Chapter IX “Shelob’s Lair”. It’s a terrifying blend that would likely frighten young Michael and make the Professor proud! BEST ARTWORK: In a game with breathtaking artwork in nearly every pack, this one left me a bit underwhelmed. That said, I always find the mixed company of Free Peoples featured on the quest cards to be an interesting composition and Leanna Crossan’s work on Searching the Caves establishes the scene well. “Searching the Caves” by Leanna Crossan (2016). The Jacksonville-based artist is also responsible for two locations in the scenario, neither of which looks particularly impressive on the card, but are cropped from a larger original piece which is much more haunting and evocative. Thanks to Ms. Crossan for her contributions to our game! You can see more of her portfolio here. “Cobwebbed Cavern” by Leanna Crossan (2016). FFG gets two cards for the price of one. MY OWN WORST ENEMY: Nestled in the nauseating nexus of the caverns is the Brood Mother, the game’s latest arachnid foe of Ungoliant Spawn ilk. This mad momma is particularly fecund, turning out a nasty Spider Broodling every round that she’s in play. The Brood Mother can only be damaged when you have finished exploring her nest, which means you’re pinned down dealing with an extra encounter card from On Track as well as her foul offspring every round until you can muster the requisite progress. Bring spider repellent. MUST CANCEL TREACHERY: None of the treacheries here are absolutely devastating, but getting Forced Off Track at the wrong time can be a serious setback. Either cope with the ever-insidious “deal 1 damage to each questing character” or spend a couple rounds getting your board set up to put progress on the main quest again. AFRAID OF YOUR OWN SHADOW? All the classic shadow effect staples are here – attachment hate, additional attack, exhaust a character, attack bonus – but the most annoying comes from that sniveling little Spider Broodling who can hatch himself and come out fighting if you happen to be On Track. “Spider Broodling” by Sergey Glushakov aka Dinodrawing. He is one of the few artists in the game to have his DeviantArt profile name rather than his real name credited on the card. GO TO YOUR HAPPY PLACE: Given the other options, I could spend all day in the Cobwebbed Cavern. Unlike the other subterranean locales, this one doesn’t spike the threat dial, add to staging upon travelling, or require more progress than the main quest itself to pass. The only problem is that you’re less likely to get back On Track exploring here before the more dangerous options, but in the early game, that’s often fine. Late in the game, the Spider Burrow is a nice place to hang out to stay on course for the final showdown with Brood Mother. 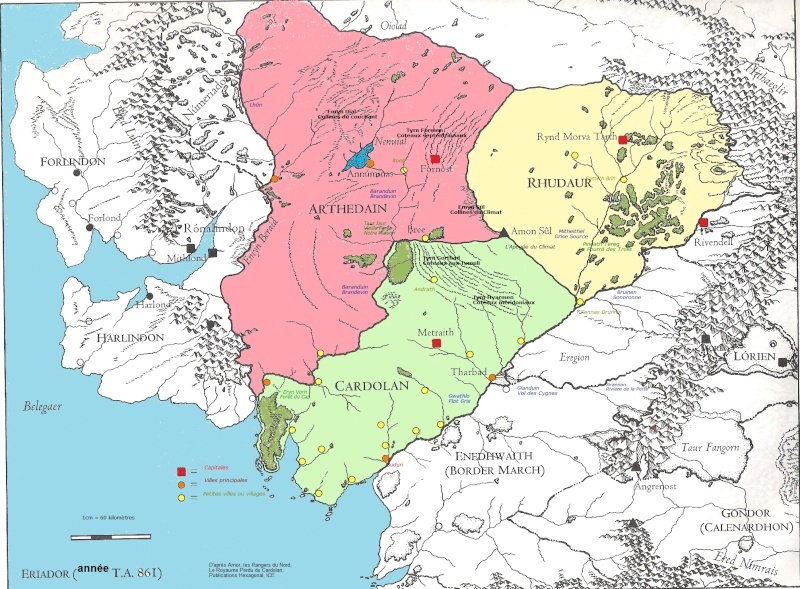 MOST OBSCURE LORE: As we get further afield in Far Harad, it is more and more difficult for the game designers to integrate specific Tolkien references into the scenario and this one trades more in general themes, eschewing the deep cut references that have thrilled me in other adventure packs. That said, I was particularly intrigued how one of the least obscure quotes in all of Tolkien’s writing was decontextualized as flavor text on one encounter card. The Nest of Vermin location is described as “a nasty, dirty, wet hole, filled with the ends of worms and an oozy smell”. This, of course, is taken from the very first paragraph of The Hobbit where the Professor is introducing Bilbo’s home by detailing precisely what type of hole it is not. Needless to say, our dear Halfling hero would be decidedly far from “comfort” in this sickly cradle of Creature enemies. Two types of holes in Middle-earth. DECK-BUILDING TIPS: This scenario spams the staging area with extra cards every round, especially with locations as you fall Off Track. As such, a good location control strategy or high willpower deck is going to be needed to keep making progress through the caverns. Don’t bring too many allies though, or your journey may end location-locked in the darkness of a Pitch Black Tunnel. Of course, you’ll need to pack some strength for the Brood Mother battle, but overall this quest is fairly well-balanced and could be a good testing ground for any well-rounded deck. It’s not brutally difficult which actually allows for some experimentation and thematic play, rather than a finely-tuned power deck. MY MOST MEMORABLE PLAYTHROUGH: I’ve been packing one copy of Justice Shall Be Done in my deck for a while now, hoping for a chance to create an epic final round at some point in my adventures. This quest afforded just such an opportunity. Playing a Prince Imrahil Outlands deck, I felt hard-pressed in the final stage with too few allies, no progress on The Spiders’ Hive, and the Brood Mother bearing down on me. The nitro-infusion from Justice allowed me to swell my ranks by four more Outlands allies, push past the pile of locations in the staging area to make the necessary 5 progress and stand poised above the maternal monster ready to deliver the victory blow. However, resolving On Track’s Forced effect at the end of the quest phase whiffed on all three draws! My progress was all for naught. I survived the attack but was eliminated at the end of the round… by my own planning action… Where is the justice? 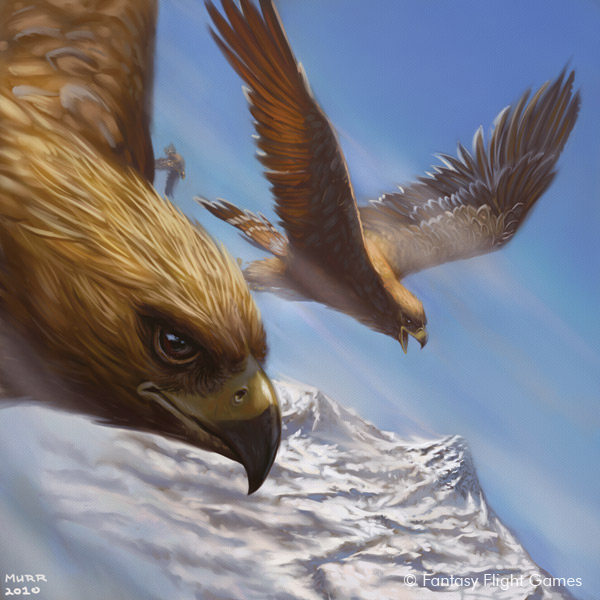 • Learn more about Far Harad in my preview article for the Haradrim cycle for FFG. • Interested in spiders, check out my feature on Ungoliant’s Spawn. 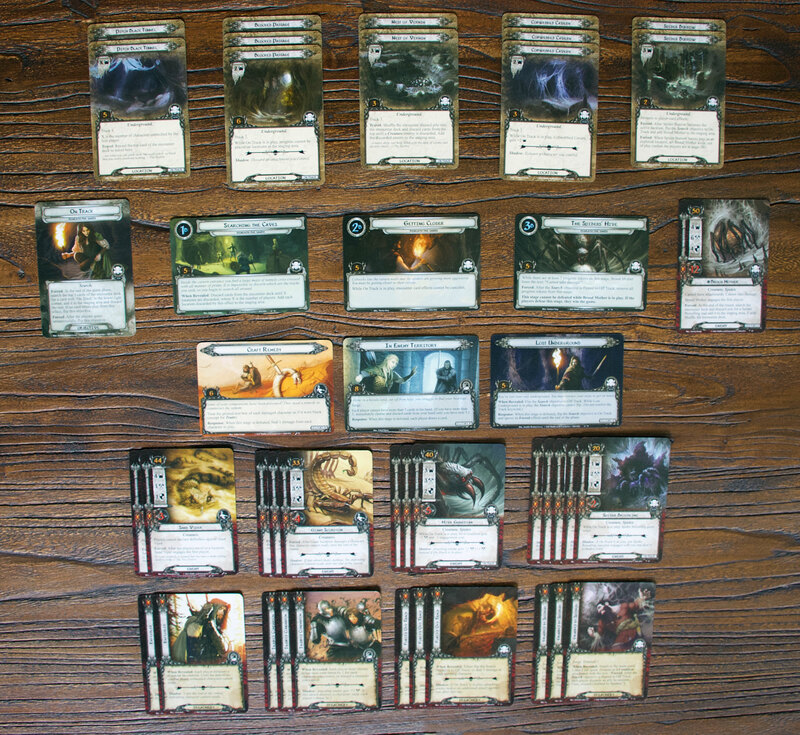 • Check out my Imrahil, Prince of Dol Amroth outlands deck at RingsDB. • Read the original release article from FFG published on May 25, 2017. • Read the preview article from FFG published on May 16, 2017. • Read the announcement article from FFG published on October 3, 2016. • Check out Secondhand Took’s first impressions of the scenario on his blog.